50 Years of Inspiring Indy Girls - Girls Inc.
We are proud to announce the kick-off of our 50th Anniversary this year! Thank you to The National Bank of Indianapolis for being our presenting sponsor for our 50th anniversary celebration. We will be kicking off the celebration with our annual Touchstone Awards Luncheon on June 20, 2019. Stay tuned for more information on Touchstone and other events throughout our anniversary! Girls Inc. of Greater Indianapolis has a long, rich history here in Indianapolis. 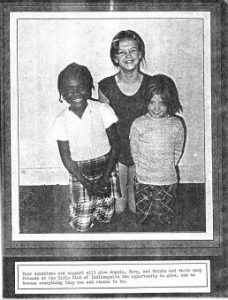 Established in 1969, Girls Inc. Indy (then known as the Girls Club of Indianapolis) was started after three Indianapolis mothers identified the need for a safe, healthy environment where their daughters could learn, grow, and develop. 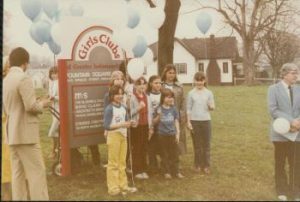 They remodeled an old schoolhouse and library at 1125 Spruce Street in Fountain Square and founded the organization before merging with the Model Cities Girls Club in 1975 to form the Girls Club of Marion County. On April 26, 1982, the organization began construction of a new facility at the Spruce Street location so that they would have more space for things like a gymnastics and athletic area, group rooms, and an observation room. During this time, the Fountain Square location moved to 1315 Shelby Street. There was also a second club located in the Mapleton-Fall Creek area, but this branch was also in need of more space. The Mapleton-Fall Creek Branch moved from 3103 N. Pennsylvania Street to a location near 40th Street and Central Avenue. With bigger, more open spaces, the Girls Clubs of Marion County hoped to serve an additional 600-800 girls at each location per year. In early 1990, the national Girls Clubs of America organization voted to change its name to Girls Incorporated. 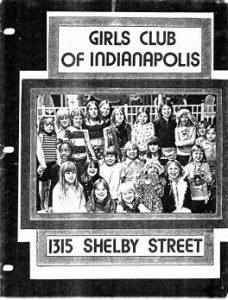 At that time, Girls Clubs of Marion County became Girls Incorporated of Indianapolis. In 2008, Girls Inc. of Greater Indianapolis shifted its model from a club-based operation to an outreach model, where all programming is done in 45 minute to one-hour increments during school time at partner schools. The outreach model was based on a strategy to reach a higher quantity of girls and to reduce overhead by leveraging borrowed space and volunteer facilitation of programs to drive costs down. In order to celebrate how far we’ve come over the past 50 years, we must look at where we started. A big thank you to all of our past and present staff, board, supporters, and volunteers for their dedication and genuine passion for inspiring girls. Together, we are making a difference. Cheers to the next 50 years!